Private Boyett entered service July 16, 1918. After a brief period of training embarked for over-sea service in September, 1918, and was drowned on the ill-fated transport “Otranto,” which was sunk off the Scottish Coast in a collision October 6, 1918. 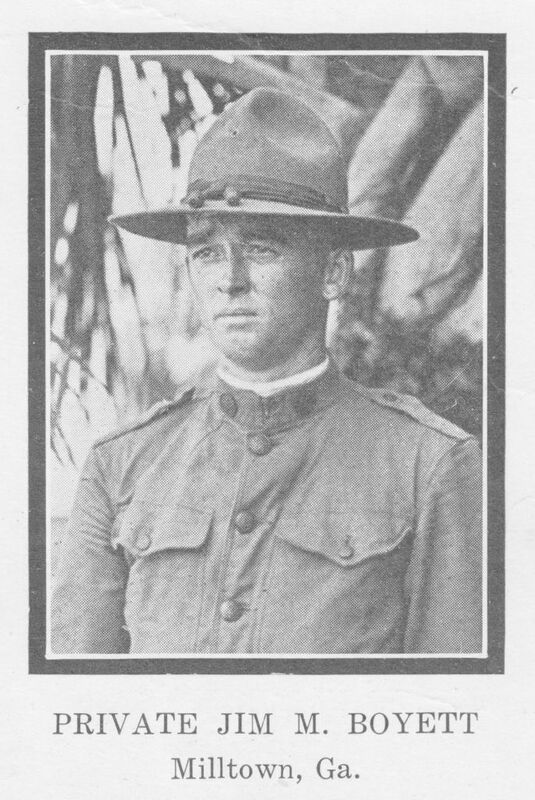 Wow, Pvt Jim Boyett is my great-great uncle! I have never seen a picture of him before. His younger sister, Beulah, was my great-grandmother. glad you are enjoying the blog. My great-uncle Ralph Knight was also killed in the wreck of the HMS Otranto along with more than two dozen other Berrien county men. I’m pleased that I could share these photos from the Georgia WWI Memorial book with you. This young man was my third cousin. Although I’m from Berrien County, I had never heard of the Otranto until the county’s sesquicentennial in 2006 when I came across a newspaper exhibit about it. I mentioned it to my mama and she told me about my cousin who had died. They were trying to jump from one ship to another during the storm. A survivor told his family that Jim Boyett could not swim and feared he would be unable to make the jump. It amazes me that we never studied this disaster when we were learning about World War I in our U.S. history class. Thanks to all who have worked on this website — it’s impressive.